GOOD RIDDANCE YOU LIBERAL HATE MONGER … MORE LIBERAL INTOLERANCE ON DISPLAY. 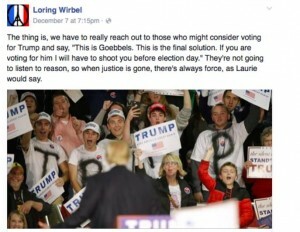 Loring Wirbel, a board member for the ACLU of Colorado has resigned after urging people to kill supporters of presidential candidate Donald Trump. Really, some one at the ACLU would promote hate speech and try taking away some one’s free speech and liberty to force their own upon them. I guess we see what the ACLU has become these days. Sorry, but making such threats is not covered under free speech. This LIB is not being sought after be police because he is a LIB. Imagine if some one on the RIGHT has made the same comment and replaced Donald Trump’s name with Barack Obama? Who thinks that the Secret Service would not be paying that individual a visit? Also, you can see the further liberal media bias by their story below referencing he Daily Caller as a right-leaning online newspaper. Trying to make some point that by pointing out the lunacy of Wirbel and his hate speech of inciting violence is some how diminished because the media outlet that outed this LIB was conservative. One would ask why CBS-Denver was not covering this because you know if the rolls were revered they would have. A board member for the American Civil Liberties Union of Colorado has resigned after urging people to kill supporters of presidential candidate Donald Trump. Loring Wirbel’s Facebook post was captured by The Daily Caller – a right-leaning online newspaper. “It’s almost like, you will think the way we think, you will do what we want you to do, or we eliminate you?” says Steve House, chair of the Colorado Republican Party. It’s the second threat against Republicans in Colorado in one week. Once again we are witness to a government that has become just too big. As reported at the New York Times, the ACLU has filed a aw suit against the federal government challenging the NSA’s phone surveillance against “We the People”. In an interesting twist, the left leaning ACLU has filed a law suit against the far-Left Obama administration over the collection of logs of domestic phone calls of all Americans where they were the target of an investigation or suspected of terrorism or not. The law suit names Director of National Intelligence James Clapper, NSA Director Keith Alexander, Attorney General Eric Holder, Defense Secretary Charles Hagel and FBI Director Robert Mueller III as defendants. It is pretty bad when the ACLU is forced to sue the Obama administration over such an issue, or face a complete lack of credibility. The American Civil Liberties Union sued the Obama administration on Tuesday over its “dragnet” collection of logs of domestic phone calls, contending that the once-secret program — whose existence was exposed last week by a former National Security Agency contractor — is illegal and asking a judge to stop it and order the records purged. The lawsuit could set up an eventual Supreme Court test. It could also focus attention on this disclosure amid the larger heap of top secret surveillance matters revealed by Edward J. Snowden, the former N.S.A. contractor who came forward Sunday to say he was their source. I have personally disagreed with many actions in the past and inactions by the ACLU, who is supposed to defend all Americans civil liberties. However, I have to give them credit here. The ACLU filed a law suit charging that the program violates Americans’ constitutional rights of free speech, association, and privacy. It is troubling that the US government thinks that it can just sweep up all data without any cause of legal search and seizure. It is even more eye opening that Barack Obama when he was Senator and candidate Obama ridiculed and vilified this program. When he became president, the program went on steroids. In the wake of the past week’s revelations about the NSA’s unprecedented mass surveillance of phone calls, today the ACLU filed a lawsuit charging that the program violates Americans’ constitutional rights of free speech, association, and privacy. 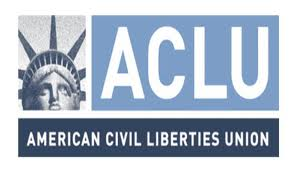 The ACLU’s complaint filed today explains that the dragnet surveillance the government is carrying out under Section 215 infringes upon the ACLU’s First Amendment rights, including the twin liberties of free expression and free association. The nature of the ACLU’s work—in areas like access to reproductive services, racial discrimination, the rights of immigrants, national security, and more—means that many of the people who call the ACLU wish to keep their contact with the organization confidential. Yet if the government is collecting a vast trove of ACLU phone records—and it has reportedly been doing so for as long as seven years—many people may reasonably think twice before communicating with us. Legal Insurrection reminds us that this was not the first law suit filed when it comes to the NSA data dragnet, Larry Klayman, former chairman of ‘Judicial Watch’ filed one as well. It does not appear that all were amused with President Barack Obama’s SOTU speech. The ACLU is expressing their ire over Obama’s TSA pat-down joke. While talking about spending more tax payer dollars on high-speed rail, Obama joked that “you go places in half the time it takes to travel by car and for some trips, it will be faster than flying – without the pat-down.” Needless to say, the ACLU was not amused. During his third State of the Union address Tuesday night, President Barack Obama cracked a joke about TSA pat-downs – and earned an immediate rebuke from the ACLU. Awkward laughter and a scattered applause followed as Obama smiled and chuckled. As Weasel Zippers stated, isn’t it great when Progressives attack each other.